In a film, comedian Vivek as Income Tax Officer would be asking Mumtaz some Qs on her IT returns – when she would say that she would complain to Captain on this… Vivek would ask as to why she should report this to Sourav Ganguly .. Mumtaz would retort, don’t you know Captain refers only to ‘Vijaykant’ !!.... Heard of ’Moiniker’ ~ which could mean “a personal name or nick name”…….. in the World of politics and in the glitzy World of Cinema, people prefer to have titles … some may be called the the maverick and great fighter – just by donning a warrior role in couple of films. In fact the ‘grand title’ makes the difference between a mere actor and a star – it is appellation that adds the star value – and heroes feel great when there is a ‘prefix’ …. There are stars – Super Star, Ultimate Star, Supreme star, little star and more….. there are Puratchi – Thalaivar; Nadikar and ….. (puratchi is rebel); there is kathal mannan; kathal ilvarasan and the like…. - so the first attempt to rise in stardom is having an appellation … which has been in vogue for very many years now. Understand that MK Thyagaraja Bhagavathar, was given the title 'Yezhisai Mannan' (king of the seven notes) in the 1940s. KR Ramaswamy was ‘nadippisai pulavar’ ……. and many more can be added to the list. Had posted earlier one on the different monikers that local rowdies have .. ‘adaimozhi’ illatha rowdy is nobody [the one without a nickname is no rowdy at all !!] so there has been ‘Mottai’ Ravi, ‘Muttai’ Ravi and ‘Kattai’ Ravi all operating in the same area. There is more reason than rhyme to the names. ‘Mookku’ Ravi has a long nose, ‘Pallu’ Ravi is bucktoothed, ‘Gundu’ Ravi is stout and ‘Kulla’ Ravi is short. ‘Kaadhukuthu’ Ravi, has his ears pierced. The TOI report had stated that Police don’t rely on just the appearance to christen criminals, though it is debatable if ‘Maadu’ Ravi is so called for his strapper looks or for his bullish deeds. It’s not for the looks that ‘Dog’ Ravi got the name — he just sells dogs. ‘Steel’ Ravi, who was killed by a gang in Erode, sold steel, though some of his gang members may talk about his steely resolve. ‘Powder’ Ravi is involved in narcotic cases; ‘Sketch’ Ravi charts out his attack plans; and ‘Porul’ Ravi supplies weapons (‘porul’ is a Chennai slang for weapon).Some others are named after their place of origin, like ‘Mattankuppam’ Ravi, ‘Pallakku’ Ravi and ‘Thoppu’ Ravi. But no, German Ravi, who was arrested in the city on Tuesday for forgery, is not from the Nazi land. The nom de guerre or the aliases gave them a stature which commoners heard with fear and rivals noted with prejudice. It was different for the popular actor MN Nambiar (Manjeri Narayanan Nambiar) who donned the role of a villain for nearly 50 years. Though he started as a hero, Nambiar soon started donning the role of a villain — so much so that his name was synonymous with villainy in Kollywood. A doyen of kalari & sword fighting, Nambiar swami was a fitness fanatic even before it became fashionable to be so. His portrayal of 11 roles in ‘Digambara Samiyar was much talked about in those days ~ but later he attained greater heights as villain opposite to MGR in many of his films. Though seen as a cruel arrogant villain on silver screen, he was a pious man in real life – spearheading bakthi trips to Sabarimala and reportedly was a pure vegetarian and teetotaler. The TOI report states that not just his flock of MLAs and vote bank, actor-politician Vijayakanth has to now work out a strategy to safeguard his popular moniker ‘Captain’. “He is an actor. To my knowledge he never served in the Army, but he has been using the term ‘Captain’ in a fraudulent manner. It is illegal and an insult to the honour and respect of the Indian Army,” said ex-serviceman K Dhandapani, who moved the Madras high court on Tuesday seeking criminal action against the actor. Justice C T Selvam, before whom the petition came up for hearing, directed the Saligramam police to investigate the complaint and register an FIR if it reveals commission of any cognizable offence by the actor. The HC order is a usual directive, especially after the November 2013 judgment of the Supreme Court in the Lalita Kumari case. As per the SC ruling, police have to inquire and register an FIR in case information reveals commission of a cognizable offence. Officers delaying or refusing to register an FIR will face action. Vijayakanth got the nickname after he acted in a movie titled ‘Captain Prabhakaran’ in 1991. In his petition, Dhandapani, who worked as sanitary inspector in the Army’s medical wing for more than 22 years, said the term ‘Captain’ referred to a high post in the Army and a person who had never served the force was not entitled to use it. ‘No response from cops, so filed petition’. Dhandapani is quoted as stating that he had lodged a complaint with the Saligramam police on February 14, 2013 and also forwarded copies to higher officials in city police administration, requesting them to register an FIR and investigate the matter in accordance with law. Since there was no response from police, he was constrained to file the petition,he said. Justice Selvam adjourned the matter to March 11 for further hearing. Captain Prabhakaran was a 1991 Tamil action film directed by R. K. Selvamani featuring Vijayakanth in the lead role. 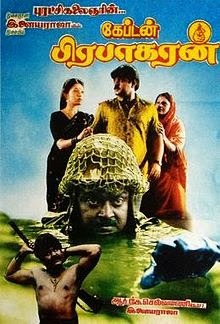 It was Vijayakanth's 100th film; the character of the antagonist Veerabhadran (played by Mansoor Ali Khan) was loosely based on the forest brigand Veerappan.